The below artworks are the most important by Giovanni Bellini - that both overview the major creative periods, and highlight the greatest achievements by the artist. Artwork description & Analysis: This painting depicts the common religious theme of Christ's time of prayer in the Garden on Gethsemane before being taken prisoner by the Roman soldiers as a result of Judas' betrayal. 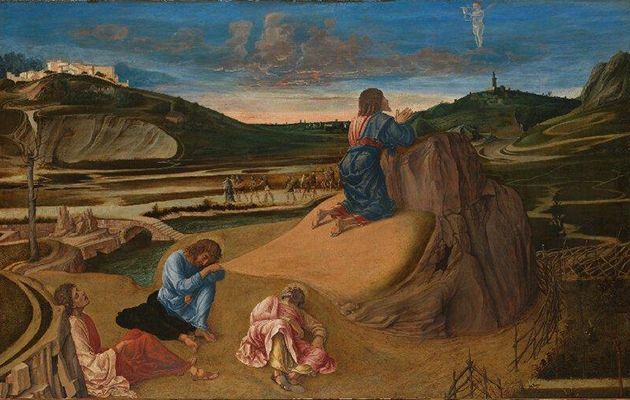 In this version Christ kneels at a rock mound in prayer, while the disciples, Peter, James and John, sleep on the ground behind him. Visible in the clouds above the kneeling Jesus is an angel, holding aloft a cup and paten as symbols of Christ's sacrifice to come. Beyond these foreground figures, in the distance, winding their way along the road, are the Roman soldiers with Judas in the lead. Bellini's fine religious parable acts also as an excellent example of his respect for the natural landscape. The topography of this painting recalls the sparse open countryside of the Lombardi region. Bellini had grown up in natural surroundings like this and his love for nature married well with his fervent religious beliefs. 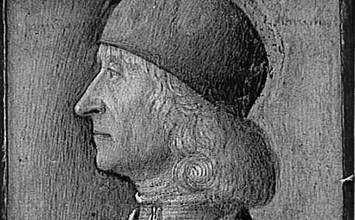 Despite never travelling further than Mantua, he was however aware of the discoveries in perspective and drawing being made in Florence thanks to his father Jacopo's travels. This new learning inspired Bellini to render the natural world around him with a realism and religious devotion not seen before. Indeed, he chose to depict landscapes with which he was familiar rather than imagine elaborate and idealised scenes. This painting is often compared to an earlier painting on the same subject by his brother in law, Mantegna, whose landscape is, by comparison, dramatic, somewhat cramped and heavily populated by angels and soldiers in close proximity. Bellini exchanges Mantegna's spires of Jerusalem for small hill top towns, much closer in reality to the settlements found in the countryside around Venice at the time. The sparseness of the countryside allows the procession of soldiers to be placed further back into the distance thereby generating a powerful sense of impending fate; the calm as the storm clouds gather in the distance. Another remarkable aspect of this painting is Bellini's rendering of the tantalizing dawn light. The pink warmth of the rising sun is almost tangible as it catches the river and rocks and floods into the broad valley beyond the viewer. The light ripples over the back of Jesus's robes with an iridescence enhanced by the addition of gold to the blue. By continuing to harness light and color in this way, Bellini earned his reputation as the master at generating atmosphere. Artwork description & Analysis: Pieta depicts the dead body of Christ being held up by Mary and Joseph. His wounds from the sword and his crucifixion are still fresh. The three figures are positioned in the central foreground with an obscured (by the three figures) rural landscape unwinding behind them. This painting is significant because it marks Bellini's move away from the stylistic practices of Mantegna and the Paduan school. It shows the artist exploring his own, more serene and intimate style; a style that was softer than that seen in his previous paintings. His open low-lying landscape is suffused with natural light and opened up yet further by the horizontal fleeting clouds and sky. The stiffly-wrapped drapery of his costumes is replaced by far softer, more sweeping, folds. The grace these peripheral changes add to the image support and intimacy of feeling between the mother and her dead son (for there can be no higher love than that between mother and only son) which is immensely powerful in its tenderness. This was an aspect of Bellini's work that becomes a recognizable feature in his paintings to come. Also noticeable here are the beginnings of his ability to infuse classical themes and compositions with personal interpretation. Though he has a vital compositional function as a third party in the triptych, the somewhat stilted figure of Joseph (when compared to Mary) is still clearly absorbed in personal grief. The fervour of religiosity so keenly depicted in Bellini's earlier work has dissipated and become something more refined and humanistic. As the art historian Roger Fry put it, "The sorrow which Bellini has here conceived is divine only in its excess of humanity." It is the simple, universal and agonising loss of a mother the viewer feels here over the loss of an ardent disciple. This is, in part, thanks to the development of the artist's rendering of the human figure. The move away from an emphasis on line and contour, towards more modelled planes and shading gives dead weight to Christs arms and softness to his skin, he is almost ready to slump out of the image. Artwork description & Analysis: This altarpiece was originally painted for the church of St Giobbe in Venice. It depicts the common religious theme of The Virgin Mary in consultation with a group of saints and a heavenly gathering. In this particular painting the saints depicted are, from left to right, St Francis, St John, St Job, St Dominic, St Sebastian and St Louis. At the base of The Virgin's throne sit three angels with musical instruments. This painting was the first example of The Sacred Conversation set within the architecture of a Venetian church. Previously, the divine group were set within a heavenly setting, whereas here Bellini brings them right down to earth. In its original place within the church of St Giobbe, the painting would have been surrounded by pillars similar to those within the space of the painting creating the allusion that The Virgin, Christ and all the saints were within reach of the worshipper. This effect would have been intensified by the familiar architecture of the painting, which is so reminiscent of the interior of St Marks Basilica, the greatest church in Venice. The gold of the cupola and the marble that lines the walls behind the Madonna are both very recognisable features of The Basilica and, having been looted from Constantinople in the 13th century, were also symbolic of Venetian international power. This use of an architectural setting for biblical scenes went on to influence many future religious painters, notably Fra Bartolomeo in his Mystic Marriage of St Catherine in 1512, now held in the Accademia in Florence. The warmth of the golden light within this picture may well have been inspired by the sacred and mysterious light of St Marks generated by the vast quantities of gold on its walls. The atmosphere is certainly one of the reasons this picture is worth noting. By this point Bellini is painting more and more in oil and in this example he uses oil to layer thin layer upon thin layer, giving richness and depth to the light suffusing the scene. Despite the inviting gesture of St Francis and the delicate rendering of the largely naked figures of St Job and St Sebastian, there is still a removed and slightly distant nature to Bellini's figures here. He is still conforming to the idea of representing a type with the saints, rather than a personality, though this was to change dramatically later on in his career. Here though there is a feeling that he is still displaying his mastery of the skills of lifelike representation and that something of the raw emotion of his earlier Pieta has been sacrificed in the study of St Sebastian's technical positioning and the Madonna's austere expression. Artwork description & Analysis: Bellini's portrait was most probably completed in the first year of Doge Leonardo Lorondan's rule. It shows the bust of the Doge in full ceremonial dress, in three quarter view, sitting behind a pedestal before an open blue background. The painting is most significant because of its importance to Venetian portraiture and Italian Renaissance art as a whole. The fifteenth century was witness to big changes in formal approaches to art. The increasing ability of artists to render truly lifelike portraits meant demand soared during the first half of the sixteenth century too. Vasari (writing in 1550) stated that Bellini "introduced into Venice the fashion that everyone of a certain rank should have his portrait painted either by him or by some other master." Though Florence is often considered the forerunner of the Renaissance, Venice's trade links meant the great artists' studios, like Bellini's, were open to advances in other countries, most notably the Netherlands, but also through Sicily, another vibrant trading port. This portrait shows evidence of a Dutch influence. Firstly, and most notably, the sitter is depicted in three quarter view as opposed to the more usual Italian profile of the time. Though this is not the first use of this technique in Italy it is a prime example of how much more intimate and powerful the viewers' connection to the sitter becomes in this format. Secondly the sitter is positioned behind a pedestal, placing him in space, with the illusion that he is just there on the other side of an opening to the viewer. And lastly, it is painted in oil rather than tempera. Bellini's mastery of this medium, new to Venice and Italy at the turn of the century, enabled him to paint with the subtlety that here renders the Doges skin so soft and realistic. The picture also displays the sparseness and the sense of light more closely associated with the Dutch masters. But here Bellini is adapting it for specific reasons. Fiercely and proudly republic, Venice was aware of the dangers of celebrating the power of a single elected individual and the doge was constantly held accountable by his peers. 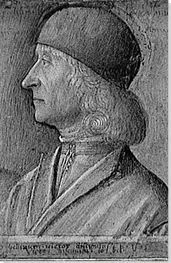 Doge Lorodan campaigned (an won his election) on the strength of these democratic ideals, effectively presenting Bellini with the task of portraying the ruler of Venice without elevating him personally. Subsequently this portrait is possessed with the diffused blue sky light of Venice. 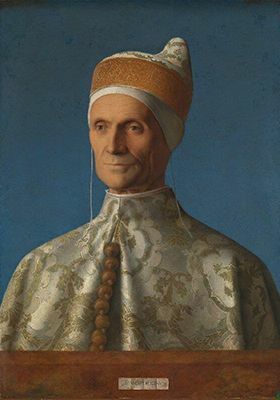 The serenity and averted focus of the Doge's eyes perfectly personifies "The Most Serene Republic of Venice" (as it was often called) while the ceremonial robes describe the state's love of pageantry and tie the sitter firmly to his office. This is a picture of the ruling doge as the personification of his proud city. 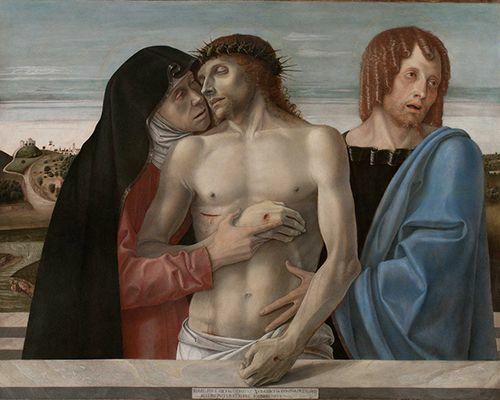 Artwork description & Analysis: This painting, once more an example of oil on board, is widely considered Bellini's finest work. The art critic, John Ruskin, went so far as to describe it as the best painting in the world. It too depicts the common religious theme, the Sacred Conversation. 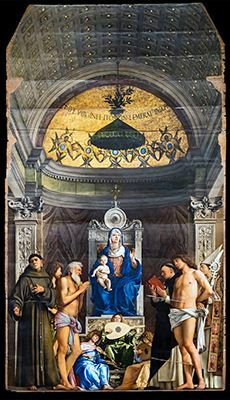 As with many other examples, it shows the Madonna and Child at the centre of the painting, flanked on both sides by the figures of saints, arranged in a traditional pyramidal structure. In this case the saints are, from left to right, St Peter, St Catherine, St Lucy and St Jerome. The group are positioned within sacred architecture, The Madonna and Child enthroned beneath a half cupola. Made very late on in his career, this painting shows the entirety of Bellini's mastery in rendering the human figure and perspective. It is also an example of how he used color to knit together the composition. The contrasting and complimentary arrangements of the robes of the saints generate a harmony between them that is deeper than the simply structural. The poise and serenity of the faces of the saints, St Catherine's far away smile and St Jerome's absorption in his book, give the saints a life of their own with which they are very rarely seen, and which is not present in the earlier St Giobbe altarpiece. Ernst Gombrich describes the significance of this in the popular art history tome "The Story of Art" when he says, "In the earlier days, the picture of the Virgin used to be rigidly flanked by the traditional images of the saints. Bellini knew how to bring life into simple symmetrical arrangement without upsetting it's order." 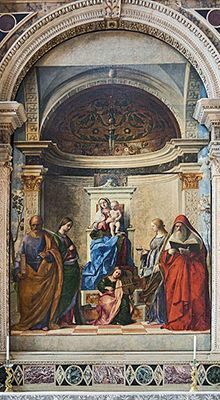 Set above a side alter in The San Zaccaria Church in Venice, the painting and its perspectival architecture give, as with the St Giobbe example, the allusion of being simply an extension of the inner space of the church. Thanks to the peripheral views of the open plains, however, this example gives a greater sense of light and space than its illustrious predecessor. Artwork description & Analysis: This is the greatest example of the small number of secular pictures that Bellini made toward the end of his life. The painting is a complicated composition reminiscent of a roman frieze in its horizontal layout. 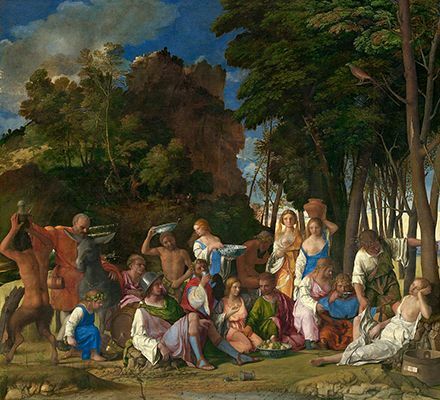 It depicts a scene from Ovid in which some seventeen figures including Bacchus, Hermes, Jupiter, Pan, Neptune and Apollo, feast in the forest. It was commissioned by the duke of Ferrara for his study and thus the subject matter was allowed to be of a more private nature. Many of the goddesses and nymphs have their breasts exposed and Priapus, the man in green to the right-hand side of the painting is attempting to lift the skirt of the sleeping Lotis. There are many symbols of sexuality running through the painting and it is thought the couple in the centre, the lady in peach and the man next to her with his hand between her thighs were portraits of the Duke and his wife. Though Dosso Dossi made alterations to the painting after Bellini's death (at the behest of the Duke) the main alteration was by Titian who reworked the landscape, while leaving the original Bellini figures intact. The painting is filled with the vibrant colors Bellini was famous for, most notably the blue robe of the young Bacchus on the left. Though these figures are gods there is really very little to delineate them as such. To all intents and purposes this is a naturalistic scene of people enjoying life in the landscape. This interpretation may be due to Bellini's inexperience at this type of painting, but it may also come down to his humanization of mythical characters normally considered beyond the reach of mortality. Oil on Canvas - National Gallery of Art, Washington D.C.
First published on 14 Mar 2019. Updated and modified regularly.